Welcome to my John Lennon Web Site! This site started out on March 7, 1999. Vote for your Favorite Album, Favorite Song, Favorite Beatle and a few more. Cast your vote now! Nobody could twist words around better than John! Here's a sample of Lennon's best lyrics. My top forty list of Lennon favorites.including the lyrics. 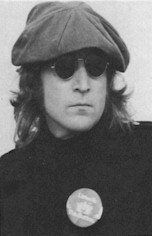 Check out other cool Lennon sites on the web. Some cool Web Rings to check out!